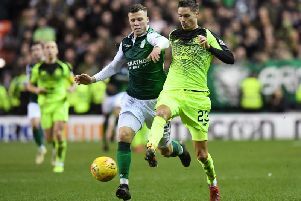 Martin Boyle could win a first cap for Australia in a friendly against Kuwait in the Middle East next month after Socceroos new coach Graham Arnold admitted he’s been impressed by the Hibs winger. Arnold spent time with both Hibs and Hearts – who have five “eligible Australians” between them – and at Celtic as he embarked on a “getting to know you” visit to Scotland. Speaking to The World Game, Arnold said of Boyle: “He is a player, from what I saw, that we do not have too many of – he is another (on-loan Celtic winger) Daniel Arzani. A cap against Kuwait on October 15, however, wouldn’t tie Boyle to Australia as it won’t be a competitive match but would give Scotland boss Alex McLeish some serious thinking to do. And McLeish was at Easter Road on Tuesday night to see him produce an impressive performance despite Hibs being knocked out of the Betfred Cup on penalties by Aberdeen.